But Indian Prime Minister Narendra Modi and his Pakistani counterpart Imran Khan failed to address the underlying threats to stability, raising the likelihood of renewed escalation. Modi, who seeks re-election this spring, played to his Hindu nationalist base with India’s tough response to a suicide attack in the Indian-controlled part of Kashmir that killed dozens of Indian troops. India bombed inside Pakistan, saying it targeted training camps of Jaish-e-Mohammed, a militant group that claimed responsibility for the attack. The strikes drove up Modi’s popularity, reinforcing the message that an uncompromising stance toward Muslim-majority Pakistan pays off politically. Khan sought to de-escalate, promising talks and an investigation. The premier has made peace talks with India a recurring theme, as he focuses on his country’s struggling economy. Yet Pakistan’s deadly militant groups — many spawned by the Pakistani military as proxies against India — are becoming increasingly difficult to control. Their continued presence is bound to trigger renewed tensions, said Moeed Yusuf of the Washington-based United States Institute of Peace. “The bottom line is that Pakistan’s international image and standing cannot be fixed (as long as) these groups remain alive on Pakistani soil,” he said. Already Pakistan and India have fought two wars over Kashmir, a former princely state tucked away in the Himalayan region that is divided between the two rivals but claimed in its entirety by both. A Feb. 14 suicide attack killed more than 40 Indian soldiers in Indian-controlled Kashmir. Jaish-e-Mohammed claimed responsibility. 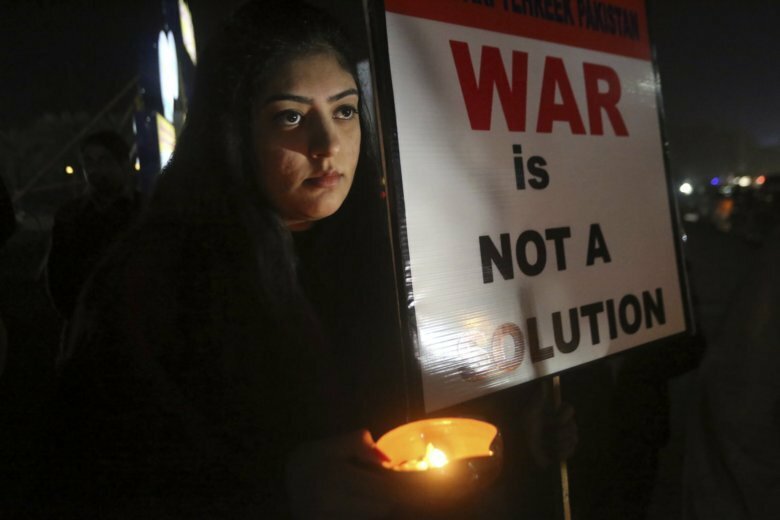 Last Tuesday, Indian aircraft bombed in Pakistan saying they targeted the group’s training camps and claimed the strikes killed many militants. Pakistan and journalists at the site said the bombs hit empty fields. Pakistan retaliated the next day, downing two Indian aircraft and capturing an Indian pilot. Khan went on national TV, offering Modi peace talks and promising an investigation of the suicide attack. Later that day, India handed over a dossier it said laid out evidence of Jaish-e-Mohammed’s involvement in the bombing. On Friday, Pakistan handed the captured pilot to India, signaling de-escalation and raising hopes that war had been averted. India has violently suppressed widespread dissent inside its portion of Kashmir, which is the only Muslim majority state in mostly Hindu India. International human rights groups have accused Indian security forces of widespread abuses, arrests and torture. The 30-year insurgency against New Delhi’s rule has left more than 70,000 people dead. Insurgents demand either outright independence for a united Kashmir or union with Muslim Pakistan. Crackdowns by Indian security forces have spawned a new generation of homegrown militants. The bomber in the Feb. 14 attack was a local man, illustrating the depth of anger inside India’s portion of the territory. Modi has fired up Hindu nationalism as part of his election campaign, in part by using anti-Pakistan rhetoric. In this heated climate, there have been reports of growing threats toward minority Muslims. Kashmiri Indians elsewhere in the country became targets of angry mobs after the suicide attack. Khan, who has the backing of Pakistan’s powerful military, tried to play peacemaker. He said he tried to call Modi three times since Wednesday, but that the Indian leader was not picking up. Since his election last year, Khan has focused on improving Pakistan’s sluggish economy and mending relations with India. The ex-cricketer even invited Indian cricketer Navjot Singh Sidhu to his inauguration. Pakistan has a history of cultivating anti-Indian militant groups as a proxy forces to press for sovereignty over a united Kashmir. Over the years, the military and intelligence agencies lost control over some of the groups or saw their influence over them waning, said Zahid Hussain, an author on two books about militancy in the region. Jaish-e-Mohammed twice tried to assassinate former Pakistani President and military dictator Gen. Pervez Musharraf after he sought to distance his security forces from the group — even if such distance was only meant for optics. Outright support of such militant groups is no longer policy, but their continued presence perpetuates instability, said Hussain. Pakistan must take action as part of its national security interest, he said. “Pakistan needs to be more vigorous in ensuring these groups do not bring a bad name to Pakistan and give an opportunity to India to keep on blaming Pakistan,” he said. Gannon has reported from Pakistan, Afghanistan, Central Asia and the Middle East for 30 years. Schmall contributed reporting from New Delhi.